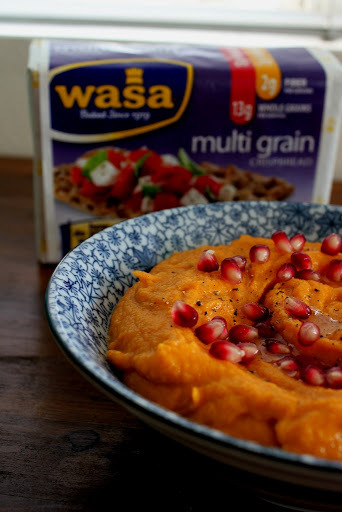 Right in time for the fall harvest and the orange of Halloween, I gift you with this recipe for Roasted Butternut Squash Hummus with Pomegranate Seeds and Wasa Multi Grain Crispbread. The colors speak for themselves. The taste? You are going to have to make this and let me know what you think! 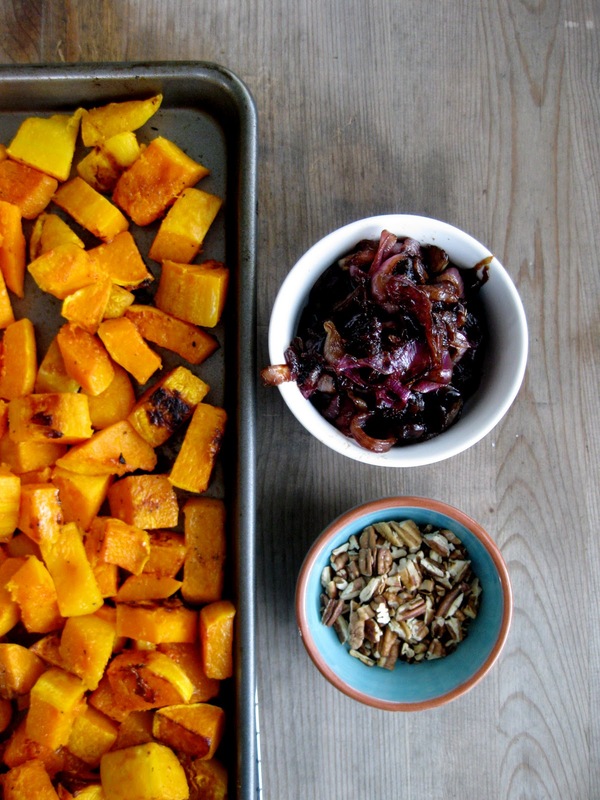 Play with the seasonings to taste, but do take the time to roast your own butternut squash. Love pumpkins? Try this with a roasted pumpkin instead. 2. 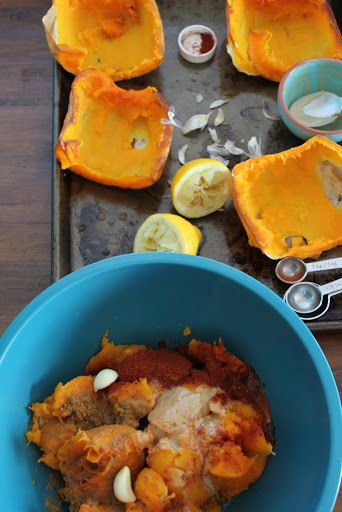 Add tahini, galic, lemon juice, cumin and paprika to the butternut squash. Puree until smooth. 3. Season the hummus with olive oil, salt and pepper. 4. Drizzle olive oil over hummus and sprinkle with pomegranate seeds. 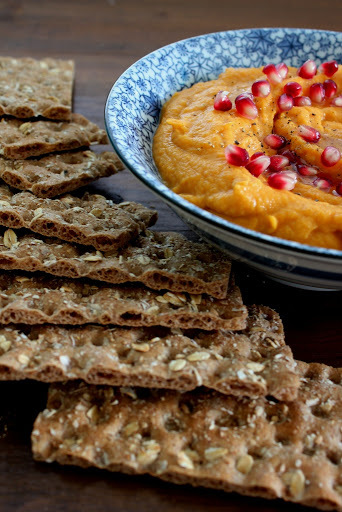 Serve with Wasa Multi Grain Crispbread. *To roast the butternut squash, preheat the oven to 350 degrees. Quarter the squash and remove the seeds. Place the squash, cut side down on an oiled baking sheet and roast in the oven for 45-60 minutes, or until the squash is tender. I’ve had a butternut squash prettily nestled in an orange colander on top of my kitchen counter for longer than a month. It’s been sitting there quietly and patiently, waiting to be used up. 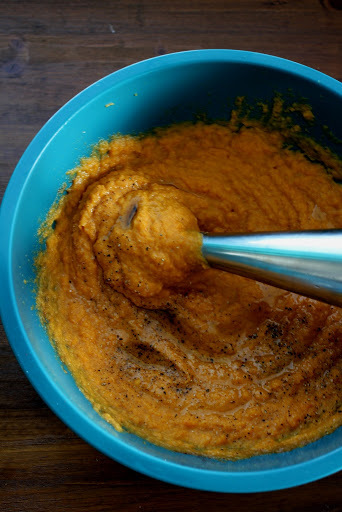 In the past, it most often had been used for soups – Pureed Butternut Squash, Potato and Poblano Coconut Curry and the simple Pureed Butter Squash. 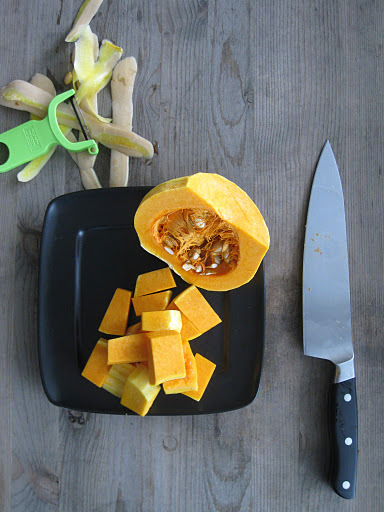 I thought it was time to branch out and turn this buttery, slightly sweet squash into something else – why not a salad? I was going to a food-centric book club potluck and thought everyone would enjoy a fall salad with butternut squash and a few other ingredients. 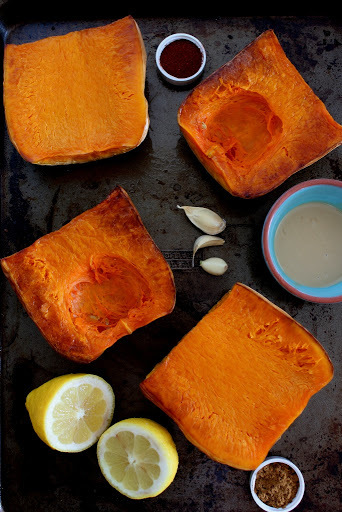 Roasting is one of my favorite ways to cook butternut squash – it allows the natural sugars to concentrate and caramelize. 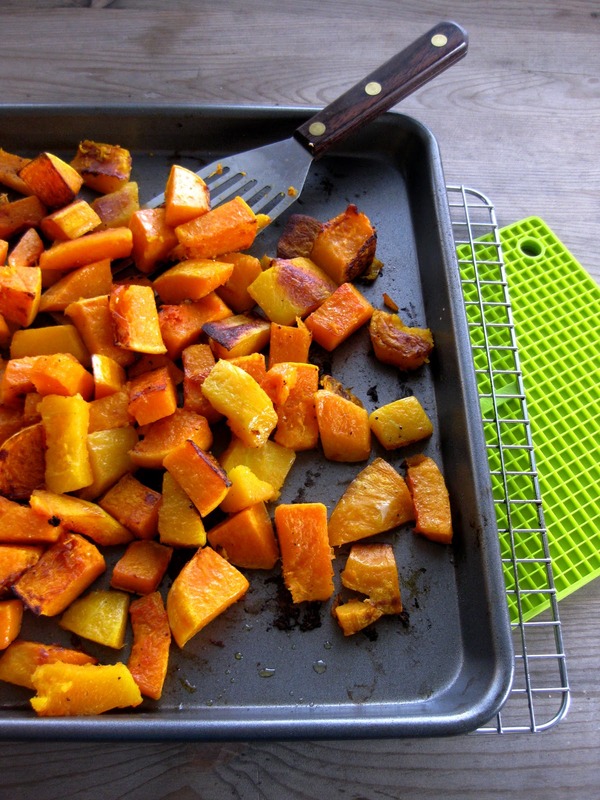 Roasting the squash cubed, rather than whole or halved, gives you even more caramelization and sweetness. I decided to continue the fall theme and use nuts and cranberries. Looking through my pantry, I realized that my cranberries had gone missing, but I did find a little bag of dried sour cherries. I picked up a red onion, sliced it and cooked with cherries and balsamic vinegar for a quick, delicious “jam”. Next time, I might make a double amount of jam to enjoy it on a toasted piece of sourdough bread. 1. Preheat oven to 425 degrees. Place a baking sheet inside the oven (this is one of the tricks that will make roasting faster – think of this as preheating your saute pan). 2. In a large bowl, combine butternut squash with olive oil, salt and pepper. Transfer to a preheated baking sheet and roast in the oven 25-30 minutes, or until the squash is golden brown and tender. Be sure to stir once or twice while the squash is baking. Once baked, remove the squash from the oven and allow to cool. 3. 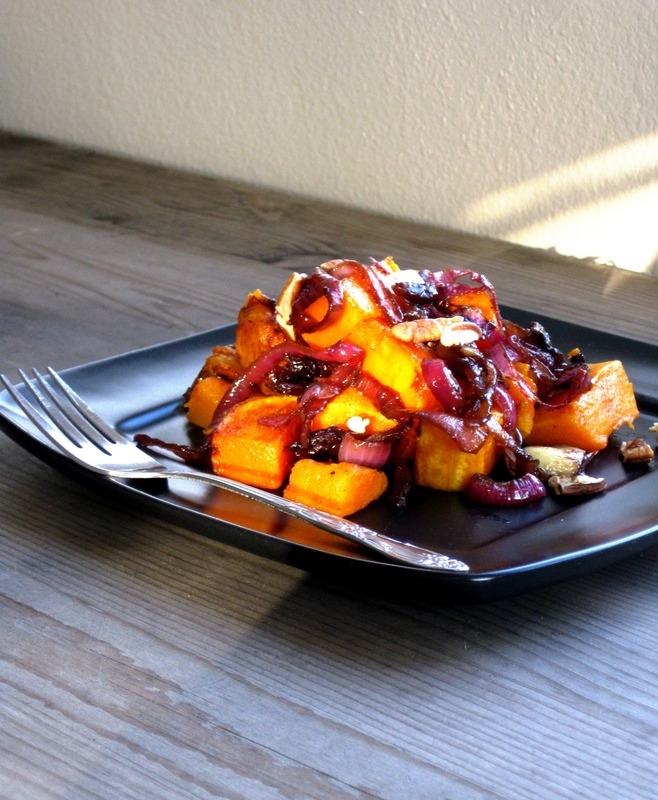 While the butternut squash is roasting, warm up olive oil in a large saute pan over medium heat. Add red onion and saute for 10 minutes. Add garlic and a pinch of sugar; continue to cook for another 10 minutes, stirring often. When the onions are soft, add cherries and a splash of balsamic vinegar (about 2 tablespoons – you can use less or more depending on your taste). Continue to cook until the vinegar concentrates and turns syrupy. The onion and cherries should be tender and “jammy” – that’s why I call this part “Red Onion and Cherry Jam”. 4. 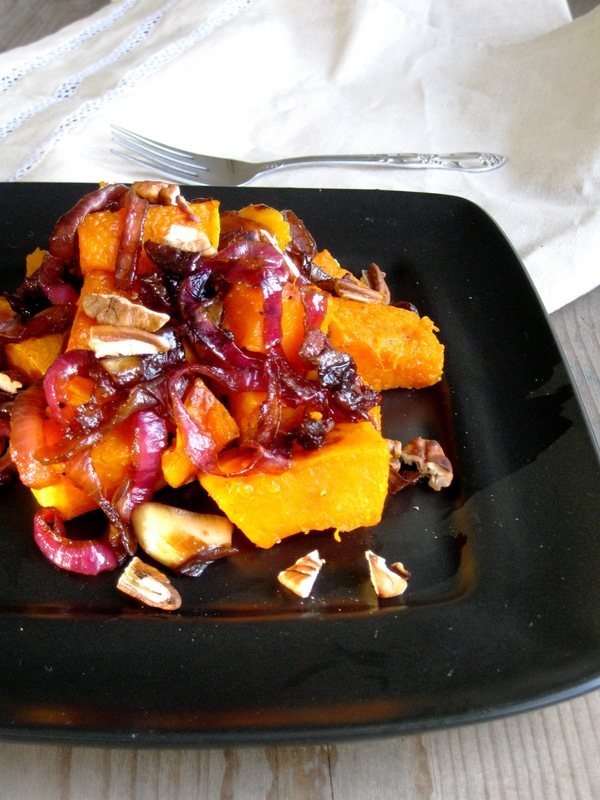 Carefully combine butternut squash with red onion and cherry jam and toasted pecans. If needed, drizzle lightly with extra olive oil and season with salt and pepper. Doesn’t this just scream “fall” to you? Perhaps you’ll want to make this for an elegant Halloween celebration. Give this one a try!